Good afternoon, true believers! 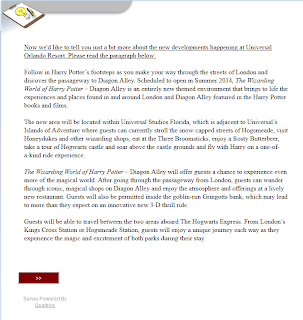 I'm here after completing a survey which Universal Orlando had just sent me asking my opinions on some things pertaining to both Diagon Alley and the Hogwarts Express. First of all, the survey says the planned opening for the land will be summer 2014, which whittles the original and nebulous "2014" down a little bit. Many have theorized it will open in June like its predecessor, and now that looks likely. 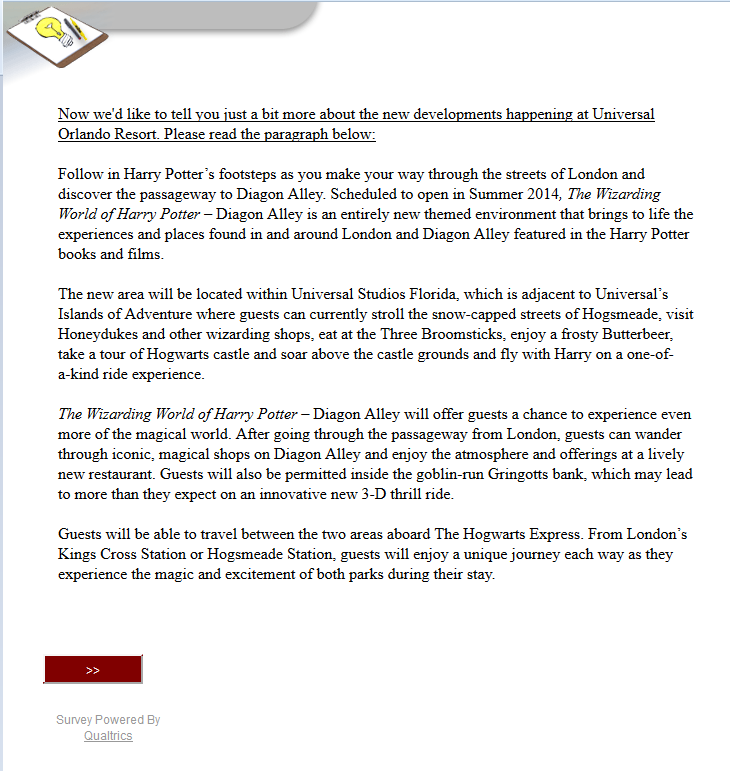 Also, the survey confirms the rumors that Gringotts will indeed be a 3D attraction. 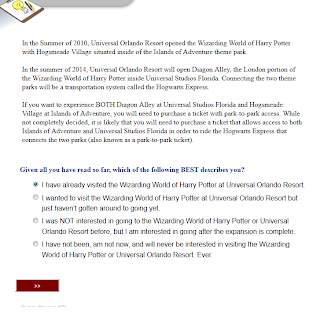 It also says it will be likely that a 2 park ticket will be required to ride the Hogwarts Express(which is confirmed to have different shows each way), but more on that later. Moving on from there, it is also confirmed that there will be different set ups for Hogwarts Express disembarking depending on the crowd levels in the park. When it is crowded, the exiting guests will be required to exit into the London Waterfront, where they will queue with the rest of the guests wanting to get into Diagon Alley/Hogsmede respectively. However, on less crowded days, they will be allowed to enter directly into the land. 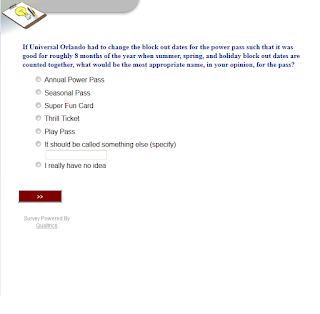 From there Uni asked questions about ticketing, including increasing blackout dates for the Power Pass, and asked what would be a more fitting name for it if they did. They also asked as a non-Floridian AP holder whether or not giving me the option to pay monthly to renew my AP as well as giving me a 30% discount on last years price would increase my chances of renewing for the 2014 year...which I obviously said it would! 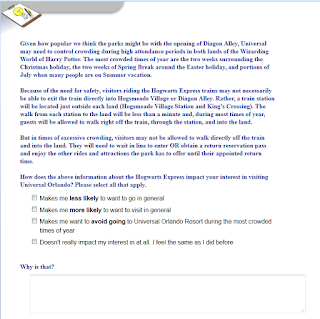 To wrap up the survey, they asked a series of situations revolving around the Hogwarts Express, which really seemed to be the focus of the survey. 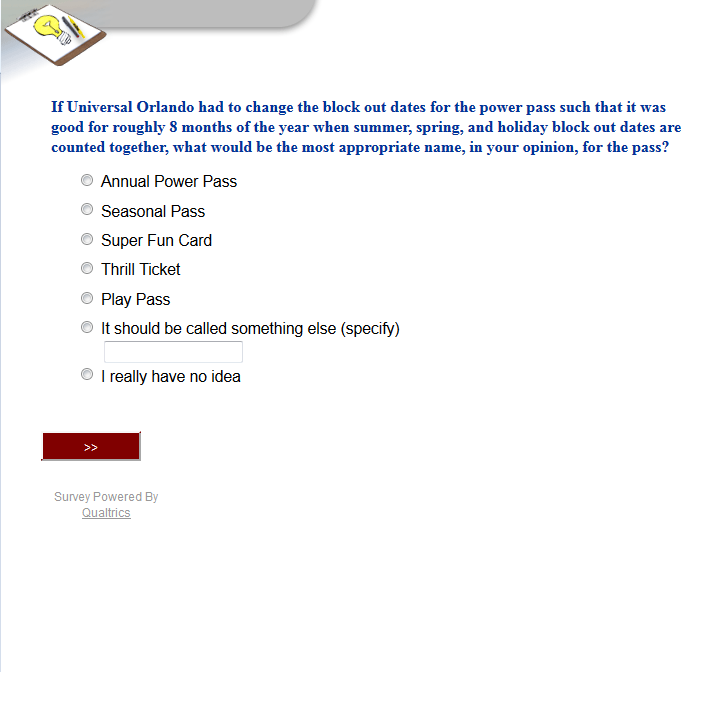 It mixed and matched ticketing situations, prices, wait times, roundtip/one-way trip, and unlimited/limited ride scenarios and asked which would be the most appealing to me. 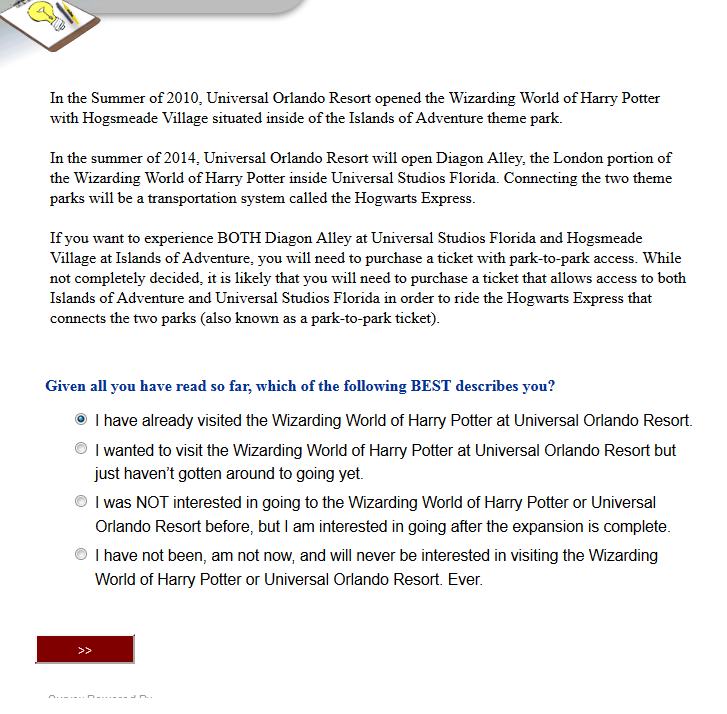 This leads me to believe Universal has still not completely set themselves on a two park ticket being required to ride the Hogwarts Express and are still hammering out the details. Well, that's all I've got for you today, everyone. Make sure you follow @Parkscope for up to the minute details as they come in! 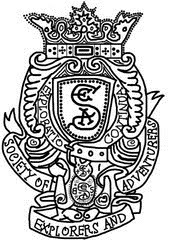 If you are planning to survey for land, then it's a very good decision you have to take. The land / building survey is very much important because it gives all information related to your land. Buying any building or land is a very big decision, so it is necessary that before buying this, you will do a survey so that you will analyze ease this is good for you or not. If you are confused that in what manner survey is completed, then you will take help from any company or experience people. By this, you will solve your problem easily.